The Firmware version v3.0 is the first major update of the LF010 limiter. 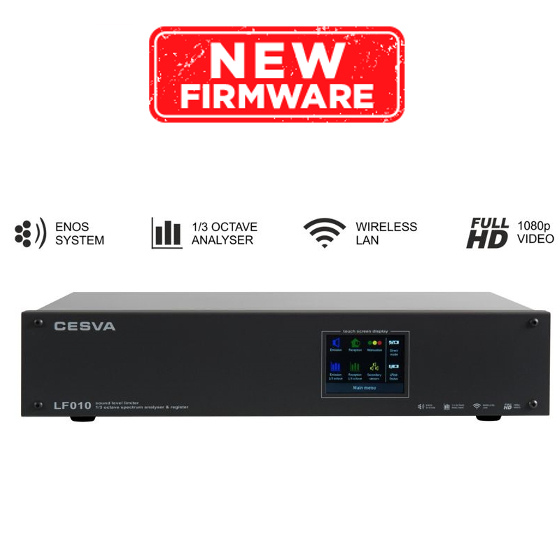 This includes new features, most of them are suggestions received from users, installers and inspection bodies during its successful first year of life in which it has already exceeded in sales the LRF-05 limiter. The firmware version v3.0 of the LF010 limiter offers very interesting new features in the musical reproduction, in the visualization in the touch screen and in the video output for HDMI devices, in the installation process, as well as in its use in live concerts. An important improvement package is aimed at using the limiter as a recorder during concerts and live shows. It highlights the "Mirroring" option that allows to replicate in a smartphone, tablet or laptop the content generated through the video output for HDMI devices, this is also very useful also during the installation process. It also highlights the sound technicians screen designed to perform self-monitoring where it is visualized, together with instantaneous and sliding sound levels, a prediction for the following minutes of the maximum possible sound level without exceeding the predicted limit. Ideal to manage the "headroom" of the event. This new version incorporates several improvements to streamline and facilitate the installation process of the limiter as the visualization of the sound level and the musical signal level during the calibration and the collection in a single screen of the webserver of all the reports: Installation, Programming, Calendars , History of actions, Data tables, etc. The new option "TEST / Mute" allows to quickly verify that the musical signal passes through the limiter, without having to disconnect cables from the limiter (power or sensor). All designed to minimize installation time and final control and minimize any incident during installation. New attenuation algorithms provide a subtle but interesting improvement in the stability of the musical reproduction and the sound level obtained. Likewise, new functionalities of the ENOS system have been designed to optimize its operation in large rooms and / or concerts where the attenuation of the public can vary substantially the initial calibration conditions. New specific features have also been incorporated for new emerging markets, such as a screen with only advertising for the video output for HDMI devices specially designed for the "retail" sector and "Singing Mode" designed for karaokes and directed activities in gyms that combine music with messages of encouragement and motivation. The update to the new firmware is done through the internet under the control of an authorized installer.